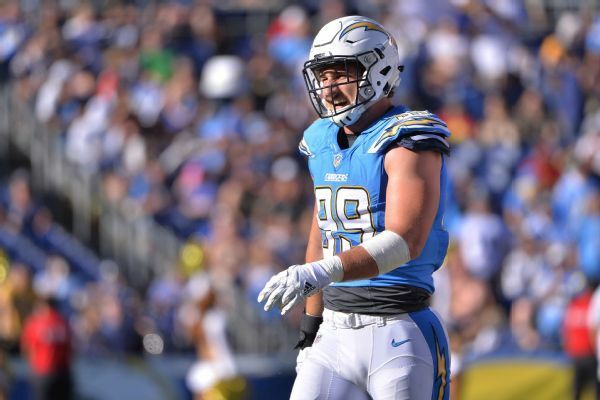 Chargers defensive end Joey Bosa is getting closer, and is listed as questionable this Sunday in the Bolts home game against the Denver Broncos. Bosa was limited in practice for the third straight day on Friday because of a left foot injury he suffered just before the start of the season. Bosa seems to be on the cusp of making his return. Speaking to reporters Thursday, Bosa didn’t say he’d play for sure but spoke in terms that showed he’s already thinking about how his body would respond to playing Sunday. Defensive coordinator Gus Bradley said Thursday that Bosa is on a rehab plan prescribed by team doctors. Bradley wouldn’t say if Bosa was playing, let alone how he could be used or how much.